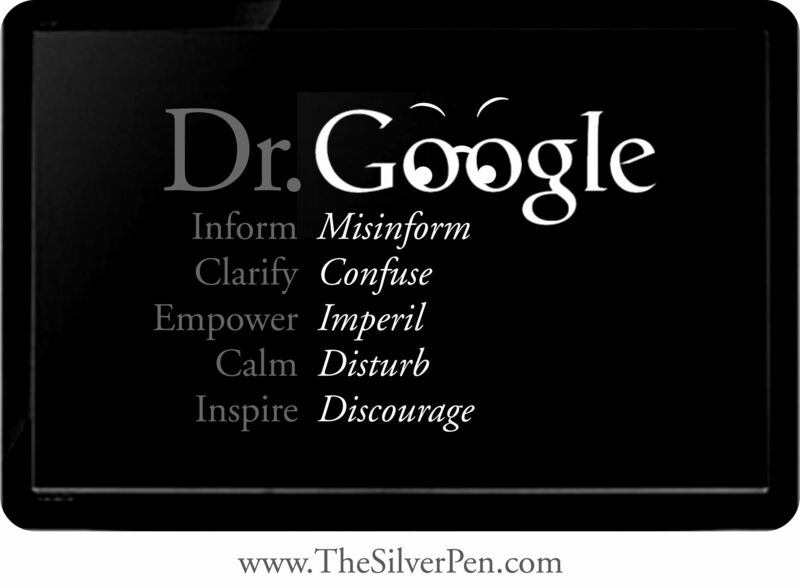 Dr Google - Don't do it! Where on earth did you find all those, Gilly? WONDERFUL. Just about sums it all up. I thought it was only us who realised the dangers of self diagnosis but apparently not. Thanks. Jon. 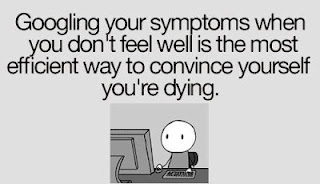 lol, google or dr. google you shouldnt use them for searching symptoms. I have come to learn that the hard way. Gilly. So your computer is not set to self destruct when you go to google. (I am beginning to believe that now and I am sure my computer has a nervous condition because of it ). And Arrow you are so right, we do learn the hard way. Jon. Thanks for Raising this important issue. I had few severe anxiety attacks 10 years back, and at that time I did not have access to google, because i was living in hostel. But now, even a smallest twitch in my eye makes me feel that there is something horribly wrong with my body. And googling it, I find that either I am having a brain tumor, a heart attack or something major. And Slowly slowly those anxiety symptoms are coming back. I signed up in this forum now, I think the best place to recover from anxiety is when you are away from all this, in nature. One more thing that helped me recover from my anxiety in past was going for a extremely tough trekking trip, where I challenged myself and my body. And when after 5 days of extreme physical work I did not get heart attack, I convinced myself that its all in my brain and nothing more. But No Google from now. I want to get really positive and totally free from this anxiety. Thanks for the creating this post. I can totally agree with the being outdoors and pushing oneself. I have started playing netball again & no heart attack. I'm finding that pushing through each day the anxiety becomes less & less. I was going to give a link to something hilarious. But it won't copy and paste the link. How do I do that? Hopefully that comes up as a clickable link and hope I typed it right. God this is so true! 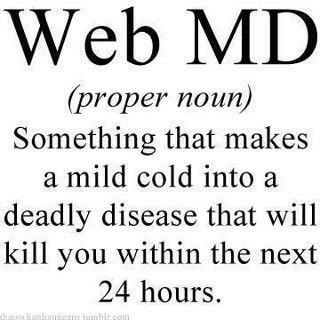 I try not to google but then I'm too scared to go to a real doctor and so I give in and of course I'm convinced that I am in the throes of some rare form of some disease! In my head I think, what the heck are you doing and thinking? But I can't help it! It's such a vicious cycle! Ugh! How did I miss this post? Brilliant ! New Zealand. I'm writing a magazine feature about health anxiety to help people understand the impact it Has on people's lives- and I am specifically writing about how Dr Google can make people's anxiety worse. I was wondering whether anyone would be open to sharing their experience with health anxiety and Dr Google with me? Oh Joy.What a wonderful example of why not to Google. This should take a prominent position on the site whenever the word Google comes up. Many thanks. Jon. Hi pip and welcome to AC. Yes, I would be happy to share with you. The first thing to realise is that with GAD (General Anxiety Disorder, which is often accompanied by Health Anxiety) the person suffering is very vulnerable to suggestion. The slightest twinge, ache or pain is blown up out of all proportion so that it often becomes a living nightmare. Let us look at what happens in a typical case of health anxiety. The nervously ill person wakes in the morning feeling down, then palpitations start. This is a common but harmless symptom of anxiety. He/She rushes off to the doctors or the A&E department to be told it is not a heart attack but anxiety. Now the disbelief sets in. "This must be more than that, I don't believe it, they must be mistaken". Then, because of the build up in tension, a headache starts. A brain tumour is indicated so off we go again to the docs. Nothing, just a headache. This is where the disbelief becomes bad and we consult Dr. Google. All the symptoms are entered and up comes the diagnosis. The headache is probably Urasian swine fever. The palpitations are certainly Mongolian wong wong disease and so on. The Google site, and many others, are a real menace to the sufferer who is fool enough to go to them. They cause endless unnecessary stress and further the onset of real anxiety. You ask if the websites can make peoples symptoms worse and that answer is an emphatic yes. We caution people on this site about going to them, but it seems as if some are drawn like a magnet. And of course they are. They are already bewildered by what is happening to them, and they clutch at straws. The various alternative symptoms given by Dr. Google make matters far worse. To a normal person this all sounds strange. "Why don't they just take what their doctor says as true and get on with their life?" Anxiety does not work that way. They would like nothing better than to 'get on with their life' but the little demon on their shoulder tells them otherwise. It is difficult to describe the feeling of apprehension and fear that accompanies health anxiety and unless you have been there it is impossible to relate. One thing is certain, Dr. Google is no help whatsoever and to say that 'well, they don't have to go there' misses the point entirely. Googling can become an addiction. Constantly seeking reassurance and finding none allows the sufferer to sink further into anxiety. We can only suggest that HA sufferers keep away from such sites, but I often feel we are losing the battle. Too much information is available; in fact there is a good case for saying that the information on illness in general is swamping out common sense. Could the reason the doctors surgery are so full be because people Google and get so frightened they have to seek medical advice? A&E departments are full of folk who have looked up advice on the web and are convinced they have some awful disease. Would Google contribute to the NHS budget to compensate for the problems caused? Anyway, that's it as far as I can see. Others may have different opinions but I would say that if those sites could be banned, and I know they can't, then I would recommend it now. Best wishes. Jon. The first time I saw my GP about my symptoms and anxiety he told me to STAY FAR AWAY from Dr Google, even back then my doctor knew how googling symptoms does nothing but fill you will doubts and fear, a tool of self diagnosis.. Dr google is a tool !! Unfortunately the damage had been done and I worried myself physically sick that I was suffering MS, ALS, and a multitude of c****rs. Yes google can make you ill, physically ill, from stress and worry, not that you have whatever 'IT' diagnoses you with. Those things didn't even cross my mind until I googled about anxiety symptoms, yes anxiety symptoms led me to MS/ALS. You start to doubt the real doctors, the real tests and seek reassurance from google, it's a trap and can become quite addictive. If they ever did analysis, say Patient A v Patient B with health anxiety, Patient A didn't have access to the internet, Patient B used it often. No doubt in my mind Patient B would be in a much worse state.